A number of people sent information and images during and immediately after Spring Stampex and the Salisbury Stamp Fair, but it seemed sensible to wrap the news into one consolidating news item rather than scatter them in daily posts. The first Stampex report is here. This shows the 2nd class and Machin Coronation stamps and receipts, and a photo of the Smilers sheet. The presentation pack was printed using unit C2 and retained the indented second row of text. 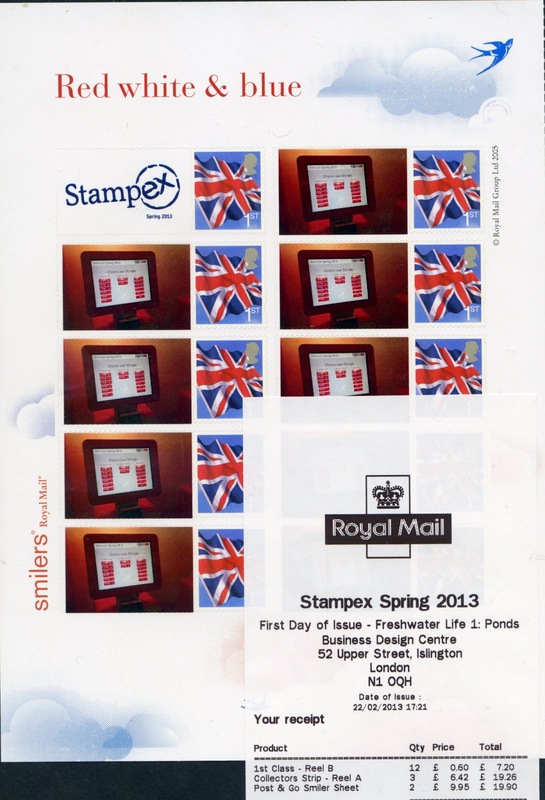 Stampex had kiosks A2-A4 with the second row of text as normal. The Coronation overprint exists in two forms, as did the Diamond Jubilee; oddly these are both from machine B1, the later one (on the left) showing a more balanced alignment of the commemorative lines. Now all we need is for the standard service indicators to show some balance. You'll note that the 'Worldwide' line seems to be inset from the weight indicators all the time. As previously mentioned the option exists on the Exhibition Hytech machines to pay for a half-sheet of 10 Smilers stamps. Here are some images of the screen displays, the printer and a sheet showing a Hytech screen shot. Thanks to John McC, Malcolm B and others for new images here. Most of the detail is shown on Brian Sinott's postagelabelsuk blog but here are some of his pictures. The Machine set-up at Salisbury, and a Smilers Sheet. Although photographs of the customer are the norm, sometimes an alternative is a good idea. I believe some alternative images were available on the Royal Mail iPad. Brian also reports that some 2nd class Post & Go Faststamps sold at Stampex (identified by the coding at the foot) have appeared with a Salisbury Stamp Fair overprint, postmarked Southampton. I have a good idea who might have produced these, but investigations are continuing. I discussed this with Allan Grant of Rushstamps earlier this afternoon but decided at the time to wait to see if anybody else had the same guess as I did ! Now that the story is also on another forum, we can tell you about it here. Rushstamps purchased the labels at Stampex so that they could overprint them using a 100-year-old letterpress machine. This was a deliberate decision once it was clear that the Faststamps sold at local events such as York, Midpex and Salisbury would not have overprints. These were used on mailing out Rushstamps pricelists as promotion for the fair. Remainders were used on ordinary mailings, which is why this piece has at least 3 or 4 examples. No mint copies exist. Allan subsequently told the Royal Mail representative at Salisbury about the overprinting. Clearly RM Southampton revenue Protection is used to Rushstamps' mailings and didn't give them a second glance. No mint copies exist, and none have been available for sale. 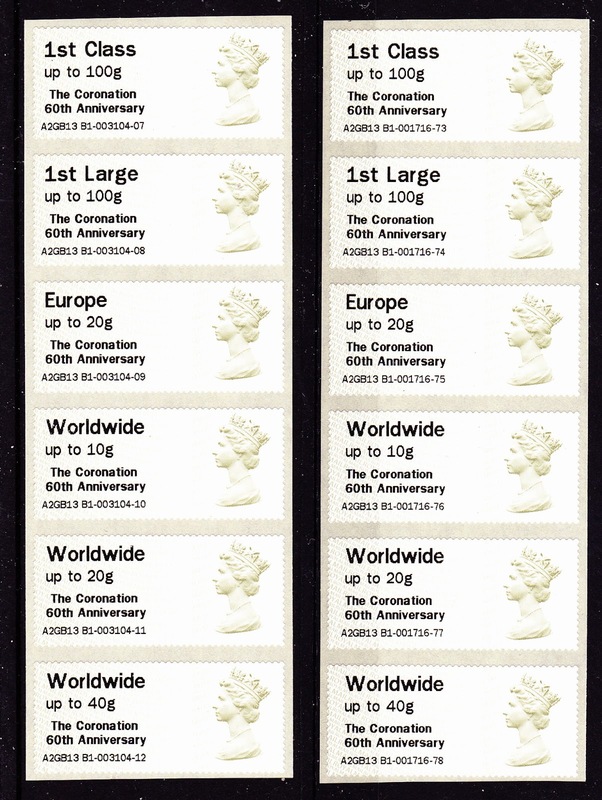 Although the overprinting of miniature sheet margins and 'Boots' sheetlets was accepted, these overprints are on actual stamps so it would not have been surprising if they were rejected by Royal Mail's revenue protection department as defaced stamps! I wasn't able to go to Salisbury but both dealers and collectors have heralded it as a huge success. One of the organisers, Tony Hender of Arun Stamps, told me that the attendance was over 1,500 - about 1,000 on Friday and 500 on Saturday, so clearly some collectors had a day off work to be there for the early bargains. “There has been so much interest already shown,” he said. “Dealers came from across the country, and there is a significant need for the two-day event. re the Salisbury overprints. I am surprised with the approach of the Revenue protection folk at RM. There have now been 69 sold on eBay. One vendor has netted more than £700 with many postmarked MUCH later than the show.